As m-commerce continues to gain ground, a new study from NielsenWire gives a little insight into how exactly consumers are getting their mobile shopping done. Surveying 5,000 US mobile users, the study shows that retailers own websites are winning the popularity contest over their official apps. The study also shows that the top 5 retail mobile apps and sites together, belonging to Amazon, Best Buy, eBay, Target and Walmart, managed to reach nearly 60% of all smartphone users during the holiday season at the end of last year, up from 53% in October. 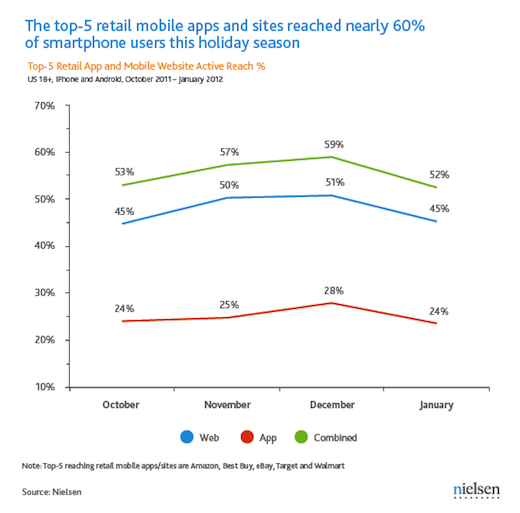 As you can see in the graph below, at the height of the holiday shopping season, 51% of smartphone users visited retailers’ mobile websites, compared with only 28% accessing the apps. The study also revealed that the preference for mobile websites over mobile apps is almost the same among men and women, with men only slightly more inclined to give the mobile app a whirl. 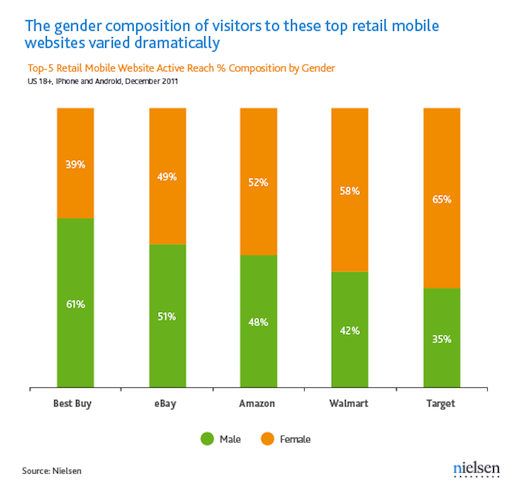 Out of the five retailers, Best Buy was slightly more popular among men, while Target and Walmart had a slightly larger female audience. The study also showed that Amazon was the most popular retailer among smartphone users, reaching about 23% of smartphone users at its peak. eBay, which snagged the second spot is optimistic about its own mobile sales, predicting that sales will exceed $8 billion this year. We recently saw that 25% of smartphone users in top markets have made a purchase on the go, with the figure highest in Japan at 40%. In the US, the figure was only slightly lower at 43%. In France, for example, we have seen that mobile usage, when out and about shopping, influences at least 26% of smartphone users’ shopping decisions in the country.